2017 has been a crazy roller coaster. I've gone through probably every single emotion that one person can experience. I found love, I lost a family member, I traveled more than any other year, I've had health issues, and I've been able to run this blog all in one whole year. Overall, I would say this year has been tough but there were some incredible things that happened to me to make it all worthwhile. I think God challenges you, not because you can't conquer the challenges, but because He knows you can get through them. I am so thankful for everything that has happened this year and I wanted to reflect back on my 2017 blog post, where I listed a few things I wanted to accomplish in 2018. I promise to love myself. I think that I've loved myself a lot this year. I have been at my lowest and have gotten back up on my own two feet and shown myself how strong I can be. I love myself for being so strong in tough times. I promise to take every opportunity. I have had many opportunities come my way and I have embraced each and every one of them. One was the chance to possibly go to California for my job and I wasn't sure if I would take it, but I'm absolutely glad that I did. I promise to go outside my comfort zone. I think this one I can say that I've successfully done. I actually ended up meeting the sweetest man ever because I chose to go outside my comfort zone. I really hate first dates because they can be so awkward, especially when you have never met the person in real life before, but the best decision I've made in 2017 was going on a date with him. It was the best first date of my life and hopefully my last first date. I am so happy that I chose to meet him because he truly has made my life amazing. He is the biggest blessing I got in 2017. I promise to learn and grow. I believe that I did learn and grow, but not school-wise, but more life-wise. I've learned who is really in my life for good intentions and who isn't. I believe I am a life-long learner so there will always be something to learn in the future, so I don't think I'm done just yet. I feel that I've grown as more of an adult and as a person. I try to be helpful and care for others whenever I can and I hope to continue that because when you are no longer here, people will remember you for how you cared about others, not how many degrees you were able to achieve. I promise to forgive. I have had many people wrong me but this year, I have forgiven them. I've learned that you can't always hold a grudge (like I love doing) because people are people and they will do what is best for them, even if it means screwing me over. I have accepted that and I have forgiven them for it. I've also forgiven people that don't deserve to be forgiven but I can say that my heart is at peace. So thank you, 2017. 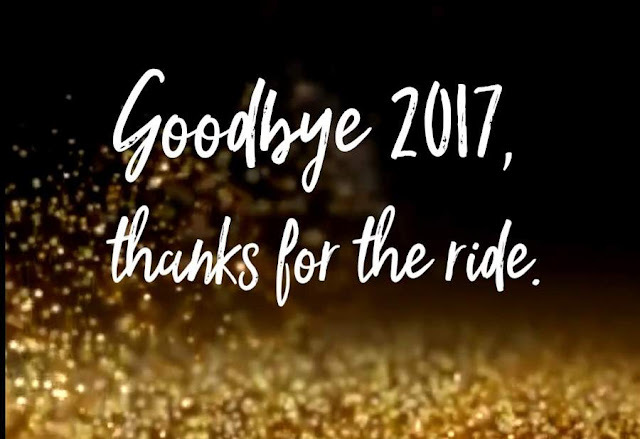 I enjoyed the ride but I am ready to have an even better 2018. I know I had a good feeling about you and I was right. Thanks for all the lessons and all the blessings.